It’s not hard to feel sorry for the Gerasenes demoniac (Mark 5:5-20). He spent years isolated, hated, feared. He’s chained up like an animal, naked, without a shred of dignity. His emotions are so violent and raw, and his mind is so disturbed, that his life is utterly senseless. He despairingly cuts himself with stones. Then along comes Jesus. At Jesus’ word, the evil spirit tormenting the demoniac flees, and he is restored to his right mind. The demoniac only has one request. “Can I go with you?” he begs Jesus. Perhaps the demoniac follows Jesus all the way to the shore of the Sea of Galilee. Maybe he clutches desperately at Jesus’ foot as He steps into His boat. Instead, Jesus sends the demoniac back to his people. This is a stunning idea. No one had ever shown the demoniac love. If he had relatives, they had long since abandoned him. Jesus isn’t heartless. He doesn’t need the demoniac’s help to tell people He is the Messiah. Certainly, Jesus isn’t trying to teach the demoniac a lesson about figuring out life for himself. Sharing your story to help others is a noble goal, but the truth is the blessing starts with you. Jesus sends the demoniac away as a gift — because sharing his story will help him experience love and acceptance and will end in community. Sharing your story to help others is a noble goal, but the truth is the blessing starts with you. In an age of distraction, few of us take enough time to reflect on the road we have traveled, to surveil where we are, and to anticipate the road ahead. The full truth about how God has saved us, set us free, given us purpose and made us overflow in love comes gradually. It is a process that takes months and years to unfold. 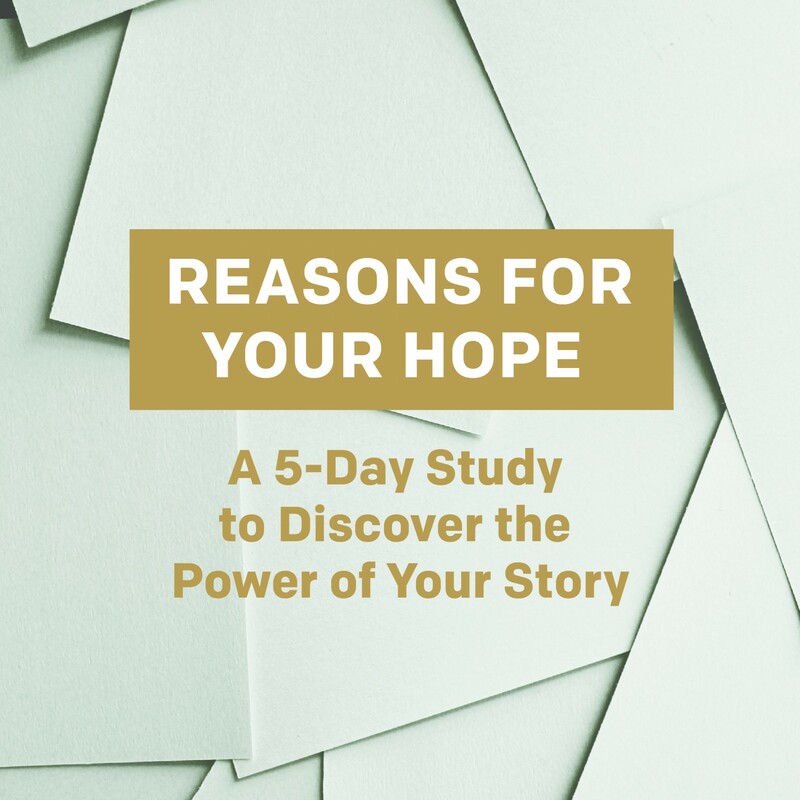 As you explore your story, you will almost certainly stir up emotions, memories, and patterns of thought and behavior you thought you’d overcome. You may notice lies or unbelief. You may recognize promises that have yet to be fulfilled. You might think, I have so far to go! This process doesn’t have to be discouraging. If you lean into it, sharing your story will deepen your understanding of God’s steadfast love and faithfulness. You may also see new ways to renew your mind and open up new areas for healing and hope (Romans 12:3-4). Even after we have surrendered our lives to Jesus, we can unintentionally hang on to labels or identities that are not ours as children of God. Your continuing awareness of God working in your life makes it easier to let go of the false story that defined — or is defining — you. Allowing others into the deepest part of our lives brings freedom, support, and encouragement. The unique experience of sharing your story publicly is sometimes the only way to achieve progress. The process tests our conviction. It forces us beyond our comfort zone. It deepens our need for God’s strength. Many Christians are deterred from sharing their story because they see it’s unfinished or because their story doesn’t end in triumph. But that’s not biblical. Struggles will continue. We will fail. Temptations will get the best of us. The only certain resolution to our stories is that our need for God’s grace will never end. Most importantly, the act of telling our stories connects us with others in acceptance, empathy, and mutual understanding. Being known is the most powerful way to be released from the fear and isolation the enemy uses to control us. Allowing others into the deepest part of our lives brings freedom, support, and encouragement, without which we will be less likely to pursue our inheritance of freedom, purpose, and overflowing blessing in our lives. The demoniac probably felt strange from time to time trying to live and work in his community as a new person, even though everyone knew his past. 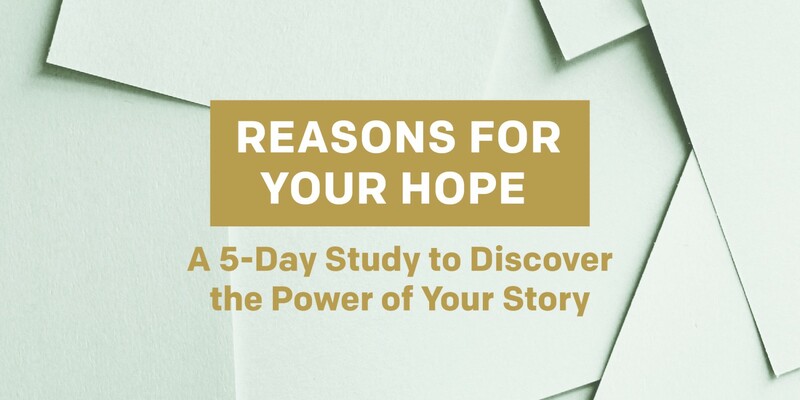 But his mere presence in the town was a daily reminder of the power of Jesus — to him and everyone else — and an everyday opportunity to live toward a future hope. What areas of your story feel unfinished? Why? Review your story so far. 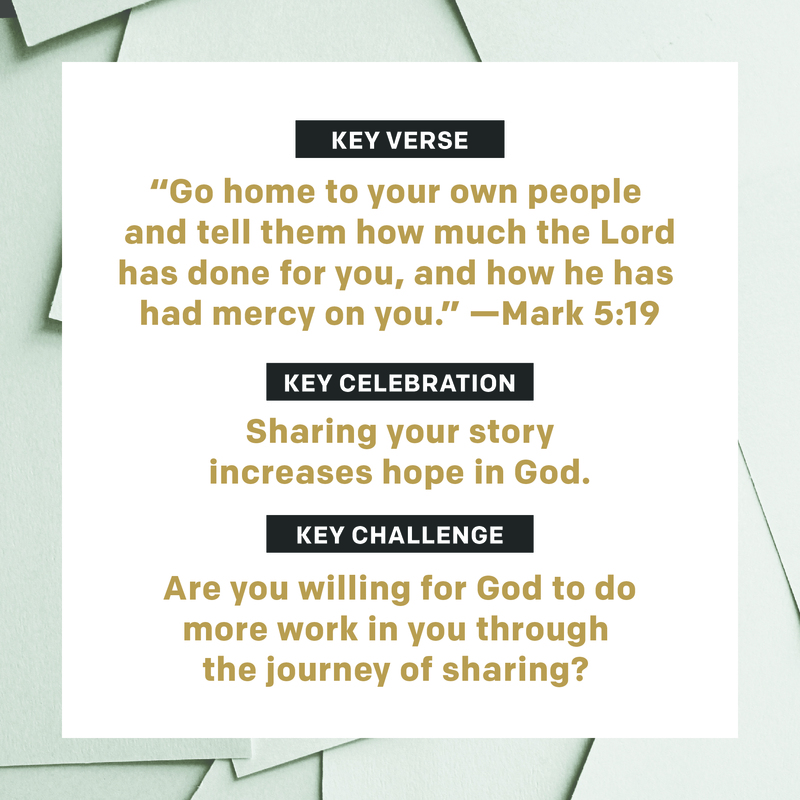 Identify the areas where you are able to claim a victory in Jesus, and decide if you need to be clearer about the work you are continuing to invite God to do in you.